New images of the liquid methane and ethane seas and lakes that reside near Titan’s north pole reveal new clues about how the lakes formed and about Titan’s “hydrologic” cycle. 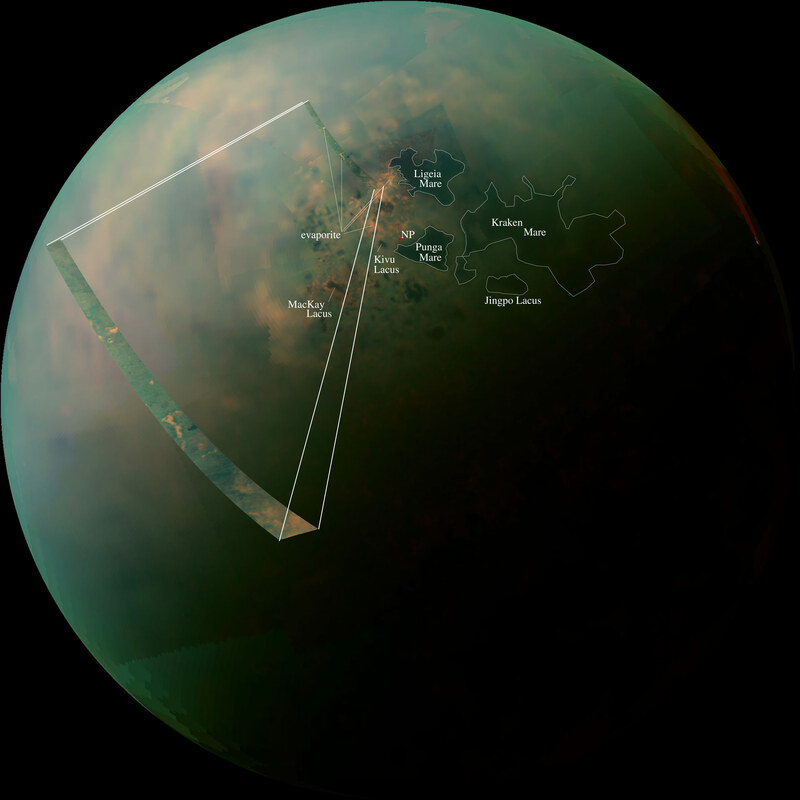 Pasadena, California– With the sun now shining down over the north pole of Saturn’s moon Titan, a little luck with the weather, and trajectories that put the spacecraft into optimal viewing positions, NASA’s Cassini spacecraft has obtained new pictures of the liquid methane and ethane seas and lakes that reside near Titan’s north pole. The images reveal new clues about how the lakes formed and about Titan’s Earth-like “hydrologic” cycle, which involves hydrocarbons rather than water. 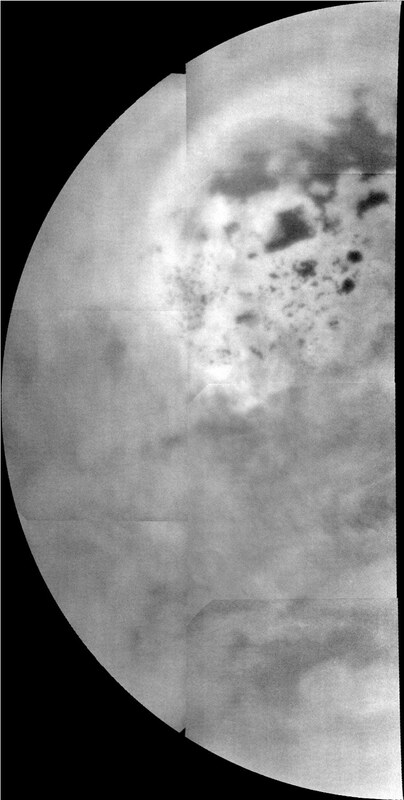 The images are mosaics in infrared light based on data obtained during flybys of Titan on July 10, July 26, and September 12, 2013. The colorized mosaic from the visual and infrared mapping spectrometer, which maps infrared colors onto the visible-color spectrum, reveals differences in the composition of material around the lakes. The data suggest parts of Titan’s lakes and seas may have evaporated and left behind the Titan equivalent of Earth’s salt flats. Only at Titan, the evaporated material is thought to be organic chemicals originally from Titan’s haze particles that once dissolved in liquid methane. 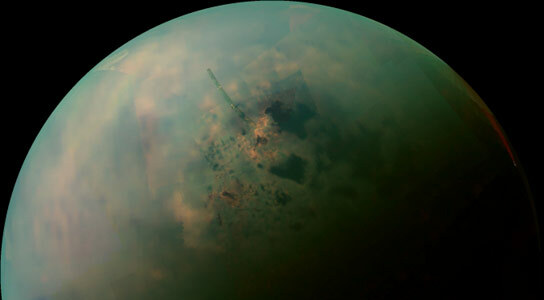 They appear orange in this image against the greenish backdrop of Titan’s typical bedrock of water ice. 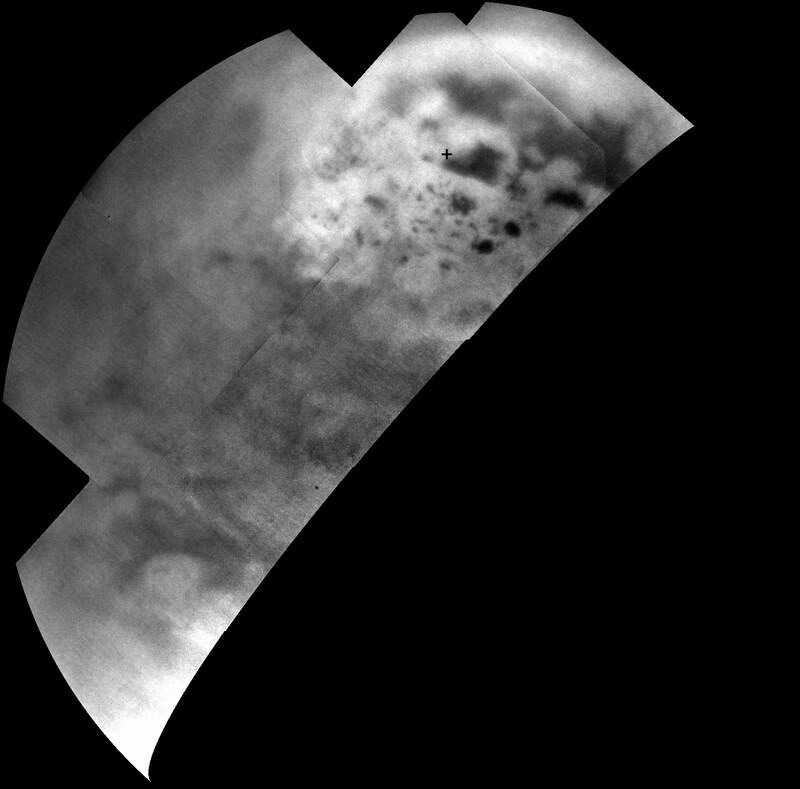 The near-infrared images from Cassini’s imaging cameras show a bright unit of terrain in the northern land of lakes that had not previously been visible in the data. The bright area suggests that the surface here is unique from the rest of Titan, which might explain why almost all of the lakes are found in this region. Titan’s lakes have very distinctive shapes — rounded cookie-cutter silhouettes and steep sides — and a variety of formation mechanisms have been proposed. The explanations range from the collapse of land after a volcanic eruption to karst terrain, where liquids dissolve soluble bedrock. Karst terrains on Earth can create spectacular topography such as the Carlsbad Caverns in New Mexico. The Cassini-Huygens mission is a cooperative project of NASA, the European Space Agency and the Italian Space Agency. JPL manages the mission for NASA’s Science Mission Directorate, Washington. The California Institute of Technology in Pasadena manages JPL for NASA. The VIMS team is based at the University of Arizona in Tucson. The imaging operations center is based at the Space Science Institute in Boulder, Colorado. All the new images are available online at: http://www.nasa.gov/mission_pages/cassini/multimedia/index.html. 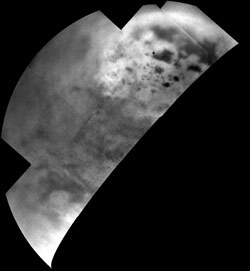 Be the first to comment on "New Cassini Images of Titan’s Hydrocarbon Seas and Lakes"